NATIONAL junior team member Rochelle Tan ran away with the 16-19 years old title in the Congressman Red Durano triathlon series in Carmen over the weekend. Tan finished the race in 1:20:36, almost 20 minutes ahead of second placer Gabriellie Gail Salimbangon, who is just 16. Rico Valentin also had a dominant win in the men’s 25-29, taking the title in 1:12:20, exactly 10 minutes ahead of second palcer Daryl Caballes. Neil Villarosa was third in 1:26:34. Jarvis Jaranilla won the men’s 30-34 division in 1:19:35, while Harrisson Pray Jumamoy (1:23:20) and Yuri Abalo (1:30:48) got second and third places, respectively. Other winners in the sprint women’s division were Fatima Cabitan (20-24), Hannah Galo (25-29), Xedessa Villo Cuyos (30-34) and Vangie Janea (35-39). In the men’s division, the winners were Eugene Sanchez (35-39), Tyron Tan (40-44) and Junki Flores (45-49). The event, which was organized to help prepare the Cebuanos for the Cobra Ironman in August, also had the mini-sprint division, duathlon and the super trikids. Savannah Chiongbian topped the kids 6-under division, while Xeemon Sagee Villo Cuyos won the 7-8 division. Niña Francesca Villaba beat Yuan Chiongbian for the 11-12 boys title, while Richomond Seville topped the girls division. Ana Maximo won the 13-15 girls title, while Rans Gerona got the boys title. READY. Ica Maximo (second from left) and the rest of the age-group participants wait for the signal from Oscar Rodriguez (left) in the Congressman Red Durano triathlon series in Carmen. Those who won the mini-sprint titles were Lloyd Ompad in the 11-15 bracket, Avegale Zapanta (35-39), Maricel Tiu (40-44), Jeremy Flordelis (20-24), James Apilado (25-29), and Jose Francis Cañizares (30-34). Those who won the duathlon were Dixon Tiu (men’s 40-44), Glean Cabrera (25-29(, Joseph Miller (30-34), Arnel Sacris (45-49), Erwin Marigomen (35-39) and Lovelieniel Casidsid (30-34). 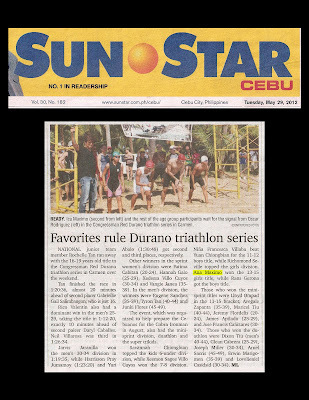 Published in the Sun.Star Cebu newspaper on May 29, 2012.